Appliance Repair Blue Book - Pricing Guide. 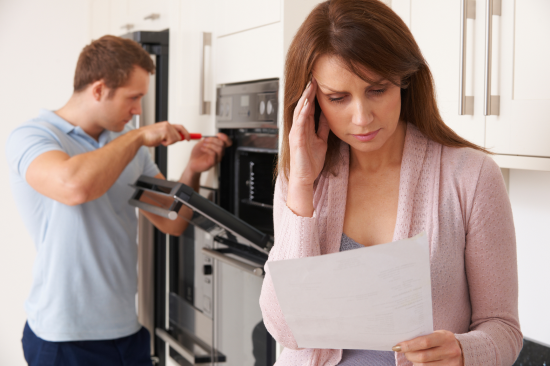 Our Appliance Blue Book makes pricing Major Appliance Repair & Service Jobs Simple & Easy! Our Appliance Blue Book will show you how to AVOID the #1 Complaint among Customers & receive valuable referrals. Our Appliance Blue Book - Pricing Guide makes pricing Major Appliance Repair & Service Jobs Simple & Easy! This Appliance Blue Book will help Appliance Service Companies & Technicians how to determine a legitimate price for a repair or service. When trying to decide a fair but profitable “Job Rates” often called “Flat Rates” according to the area you live in. Don't be mislead, you should not price your Service Charge (trip charge), Diagnostic & Repair cost the same for all areas. You need to know the Fair Market Rates in your specific coverage area. For instance, a Service Charge in Birmingham, AL is NOT the same as a Service Charge in San Francisco, CA. Over Charging as one of the #1 Complaints from Customers. This will be costly especially if you are a new company and just starting to get new customers. What's in the Appliance Blue Book? What is the Difference Between "Hourly Rates" & "Flat Rates"? Should You Use Hourly Rates or Flat Rates? We show you the difference between "Flat Rates" & "Hourly Rates" Also, the best one to use that will provide you with most profit on each and every Appliance Service or Repair job. What Should I Charge for a Service Call & Repair in My Area? The Service Call & Repair Rates in All Areas are Not the Same. This is where a lot of Appliance Repair Companies (especially NEW companies) make a big mistake. I have seen some of the suggested prices for Service Calls (trip charges), Diagnostic & Repair charges. If you were to use those suggested charges in a lot of different areas that are NOT high income or in different parts of the US. You would be OUT of business before you get started. We show you what to charge based on the area you live in... period! What Parts Should You Have on Your Truck, Van, SUV, Car? You Only Need Initial Parts When You First Start. If you are a NEW Appliance Company don't go out a buy a lot of parts until you know what you need. We show you the minimum parts to start with. If you are an established Appliance Company, you should have an idea of what you need. Appliance Parts - Where to Find Awesome Discounts & Deals on Appliance Parts. You Don't Need to Overspend on Parts. All Appliance Stores or online Appliance Stores are not equal. I learn that the hard way when I first started. We have recommended 4 Online Appliance Parts Companies that have great deals and we are constantly on the look our for new ones. 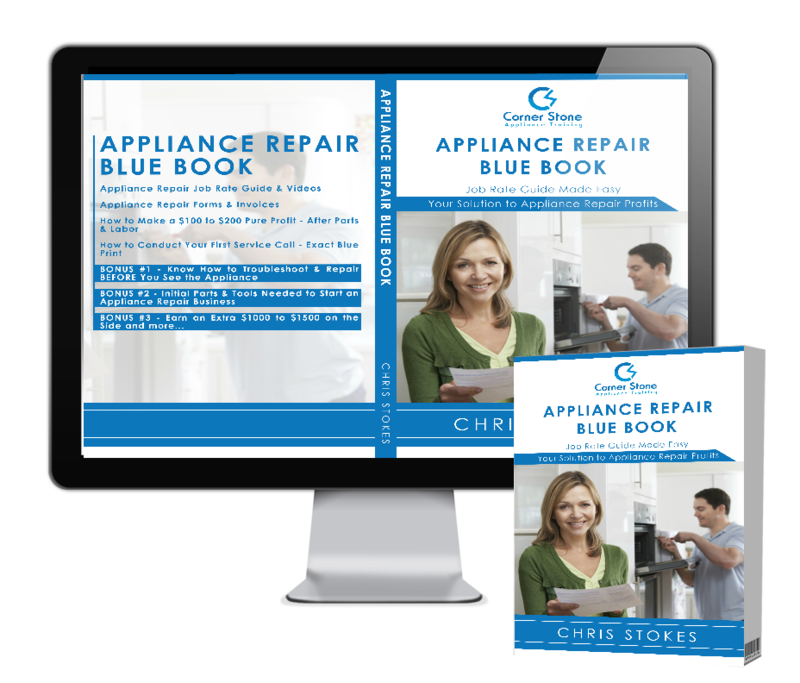 Can You Download Our Appliance Blue Book? Yes, You Can Download Our Appliance Blue Book. You can download the Appliance Blue Book or you can access it online it's totally up to you. We have not made it into a pocket guide yet. However, that is in the works and should be completed in the near future. When We Have Updates for the Appliance Blue Book. You will receive an email (the email you used to register) with any and all future updates that will help you and your technicians. Why Did We Create the Cornerstone Appliance Repair Blue Book? Our Students Requested a Pricing Guide to Determine What to Charge for Services & Repairs. Our goal at Cornerstone Appliance Training is to be the "One-Stop-Shop" for our students and customers alike. When we receive suggestions that will help those individuals start, improve and grow their Appliance Companies to the level that they desire. We will get busy on creating the program(s) and provide the tools necessary that will make your Appliance Business an Awesome success for you and your family. How will our Blue Book Help You or Your Company? Flat Rate Pricing vs Hourly Rates... Which one Should You Use? Appliance Repairs & Services... Hourly Rates! Learn How to Quote a Fair & Profitable Price for Your Services! Customers will get their Appliances Repaired... You Want to be the Go-to-Appliance Repair Guy! Testimonials - Already Making an Awesome Profit!. Purchased and Used it Today! Thank you Chris for your honesty, I really appreciate it, I have purchased it and have used it today on two service calls I made over $330.00 just today $$$ the blue book has very detail information to continue growing my business . Thank you and have a bless night.